We’d love your help. Let us know what’s wrong with this preview of The Collagen Glow by Sally Olivia Kim. All the lotions, potions, and skin-tightening masks in the world won’t accomplish what a daily dose of collagen may do. And now that collagen is easier than ever to find and use, in powdered and liquid supplements, readers need The Collagen Glow. Packed with 40 delicious recipes, this book is the ultimate guide to choosing and using collagen. It includes information on how All the lotions, potions, and skin-tightening masks in the world won’t accomplish what a daily dose of collagen may do. And now that collagen is easier than ever to find and use, in powdered and liquid supplements, readers need The Collagen Glow. Packed with 40 delicious recipes, this book is the ultimate guide to choosing and using collagen. It includes information on how collagen is harvested, what to look for in an ingredient list, and how to take it to the next level with an easy 10-step plan. To ask other readers questions about The Collagen Glow, please sign up. 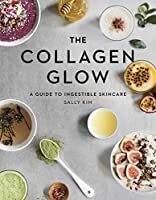 I research collagen and gelatin when my doctor recommended them to me for helping my chronic stomach pain, and I would have loved a more reader-friendly book like The Collagen Glow when I was paging through all of the PubMed articles that I had printed off from the library. Kim includes her personal experience with collagen(s) as well as a lot of the same research that I've read over. It's a well-composed and laid out book with beautiful photographs intermingled with the text. Recommended.